My instructor notes that even though the lines were generally placed correctly on the grid, what I’ve drawn was not completely accurate. Note the green and pink lines drawn on the overlay above. Also note the red arrows as to which direction the lines need to be moved. We can conclude that what I’d drawn has a great deal of distortion. An example of this is the cat’s right eye (on your left) needed to move up some. Another example was of the cat’s tail. It should had been drawn a little further towards the lower-right as it curves upward. My instructor says that the cat was enlarged correctly. With better or careful observation, as she puts it, my drawing will improve. 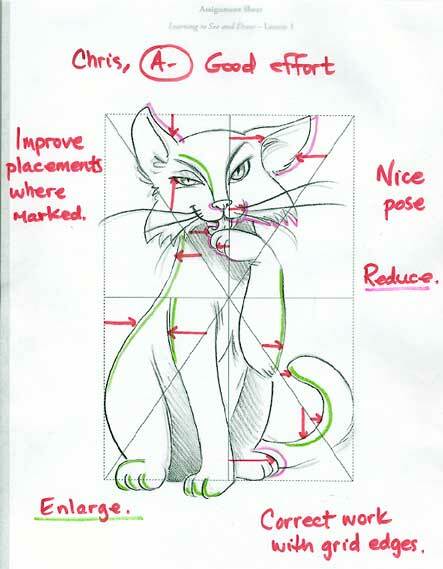 My instructor believes that the small details, curves, angles, etc were captured correctly in my version of the cat. (I think she must mean this in a general sense.) What she sees looks to be very promising. As a perfectionist, neatness is very important to me. When I can’t achieve this goal it pisses me off and leaves me frustrated. In my instructor’s view, I have achieved this. Note this post is reproduced from one I made on the ConceptArt.org forum.